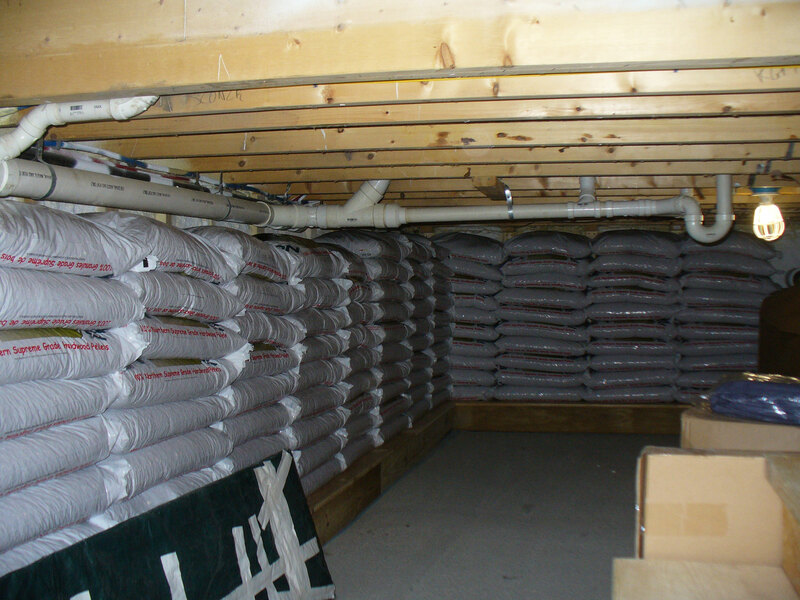 Three tons of pellets stowed in the cellar, waiting for winter. That dark taped thing in the lower left is the magic ramp we put over the stairs so the pellet bags slide down. A “invented” it – it’s a long strip of plywood covered in a tarp. That and an old office chair with no arms and back (called a “rolly stool” in this house) are all the tools we need to move pellets in. snakes live over there. “Little” garter snakes. But I still don’t want to see them I hate to lift something and suddenly see one. I hate when they scoot across my path. L is not afraid of snakes. She proved that yesterday. She and A took the lead, dumping stuff back toward me, where I could pick it up and move it away. When we found the snakes, L used a stick to put one off in the woods, and chased the other one away. I hope it stays away, since we dismantled its rock pile. So I am one big step closer to setting up that pool. Just waiting for some dry weather when I am home so I can finish the digging. And truthfully, glad that it is still wet, because my arms are sore. 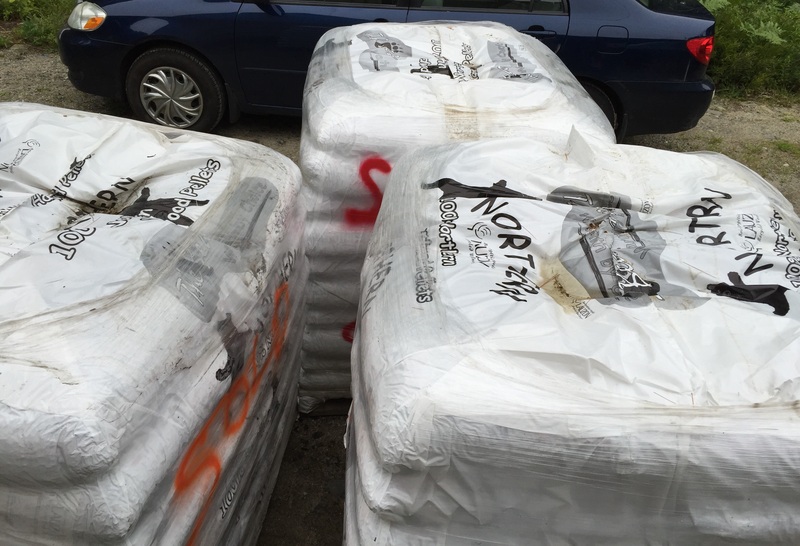 3 tons of pellets caught at the bottom of the ramp, lifted and stacked. Author salpal1Posted on July 26, 2015 Categories how I spent my day, how it came outTags pellets, pool, snakes11 Comments on Done! Lucky for you, it is cold and rainy today! I sat down a week or so ago to write and never finished that post, which means it has been a few weeks since I posted. Yikes! This is what working for a living gets me. 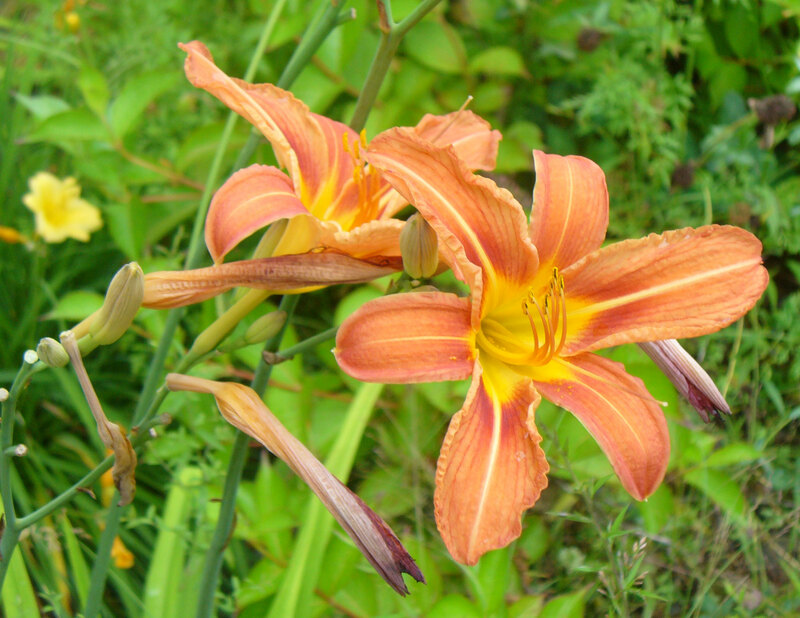 It has been a busy few weeks around here – lots of comings and goings, and work and cleaning. And knitting – lots of that! Last week, my aunt and uncle came to stay for a few days, while they worked in my cousin’s pizza booth, down in Castine, for the l’Hermione festivities. Apparently it was HUGELY successful, he sold every scrap of food he had available, and had my aunt driving around the peninsula scavenging spinach, tomatoes, etc. My aunt really enjoyed seeing the bits of the fun she could around the long lines of hungry people, I think my uncle enjoyed helping and talking to people, although they both came home absolutely exhausted each night. A and I never got down there to see the boat, but the news coverage was good, so we got to see the videos. A lot easier than dealing with the crowds! Thursday night I went into Ellsworth after work to meet Crimson Crow and see the St Andrews Maine Pipe and Drum Corps perform at the library. It is a small group of enthusiastic pipers and drummers, and we enjoyed the show. And of course, the ice cream afterwards! This weekend was supposed to be all about storing three tons of pellets in the basement, digging out the last small section of pool area, and maybe even getting the area ready to set the pool up. But two things happened to change that – the pellets were not delivered as scheduled on Friday, and it is raining, so no digging. Instead, we had a damp cookout with sister-in-law L, and did the usual Saturday chores, (which used to be Friday chores!) like the PO and the dump. A and I did the grocery shopping last night, so all that is left to do this weekend is the laundry, which A has made a good start at. I get to get caught p on blogging and Ravelry and knitting. I will try not to think about the very small area left to dig out that can’t get done until it dries out. Sigh. But the knitting/yarn is exciting. Check it out! This is the yarn I got when I went to the spinning lessons at the Purple Fleece. 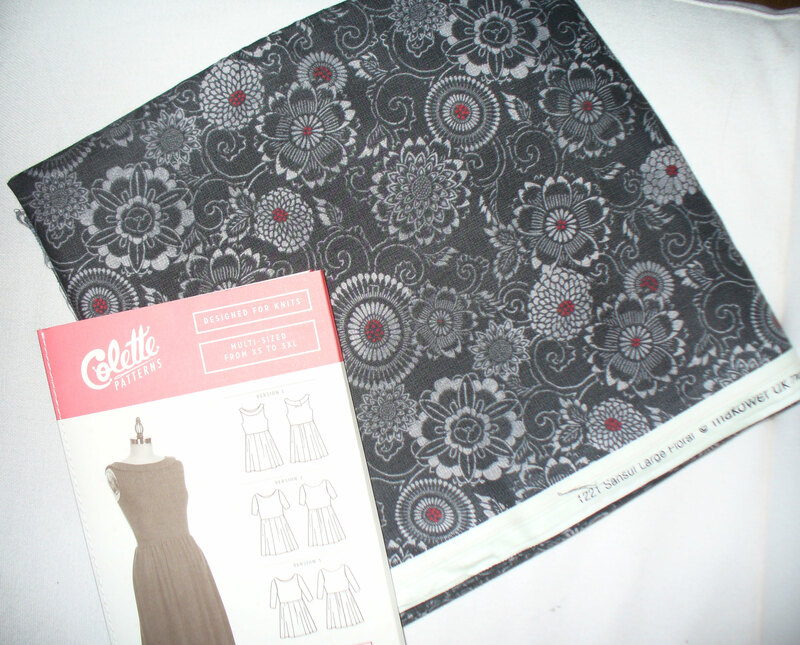 I plan to make a lace leaves shawl with it, but not for a few weeks. 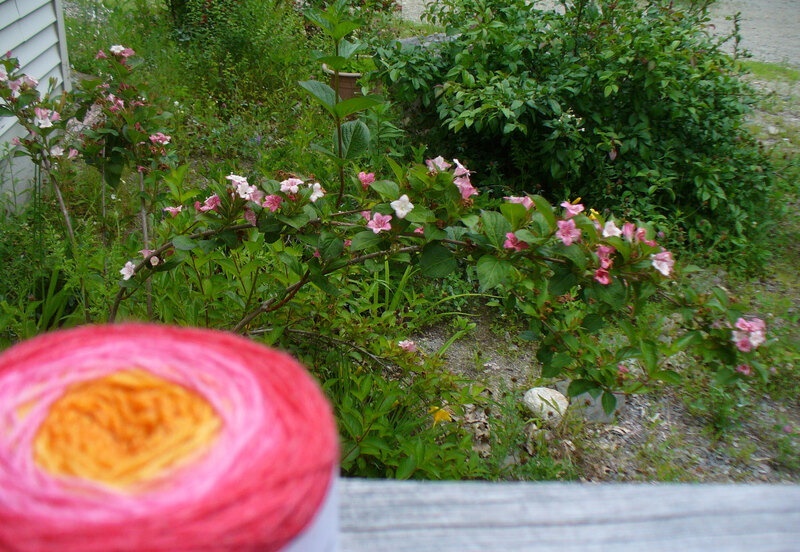 Sorry the yarn itself is blurry, but doesn’t it match my few flowers beautifully? 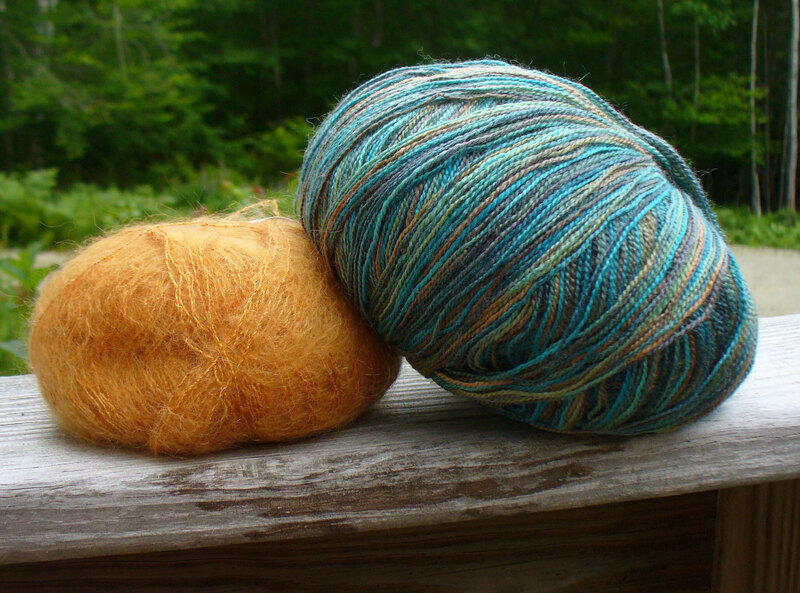 Then, this is the yarn I got at Over the Rainbow last time I was there. I might have mentioned the sweet deal I got on the Kid Seta Noir? 75% off. Makes up for the much higher price on the teal yarn! I got 4 skeins of the Kid Seta, so will likely be making a few things with it. 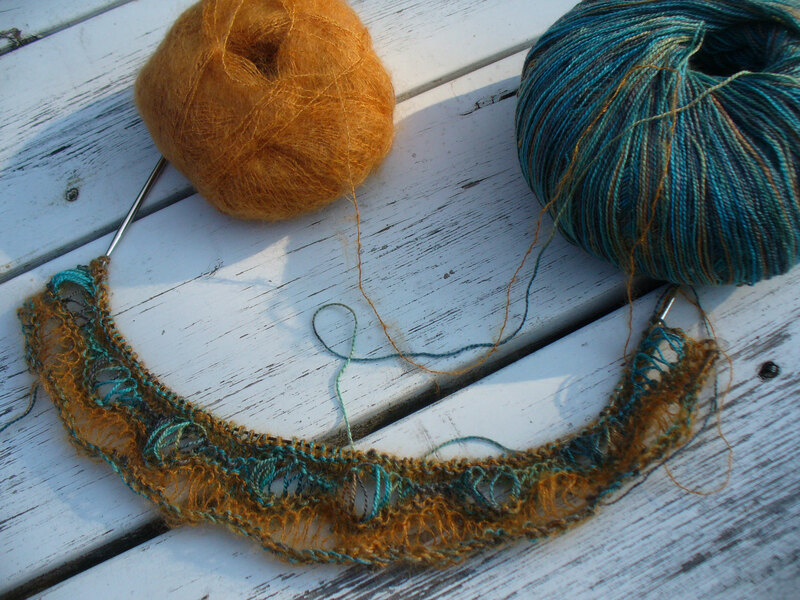 I started my scarf with it – a variation of Morning Surf. I am holding the two yarns together for all of the plain knit rows, and alternating them for the yarn over rows, and the subsequent dropping row, which I think shows off the colors well, and reduces the need to weave in ends – I can just carry the yarn up the side. 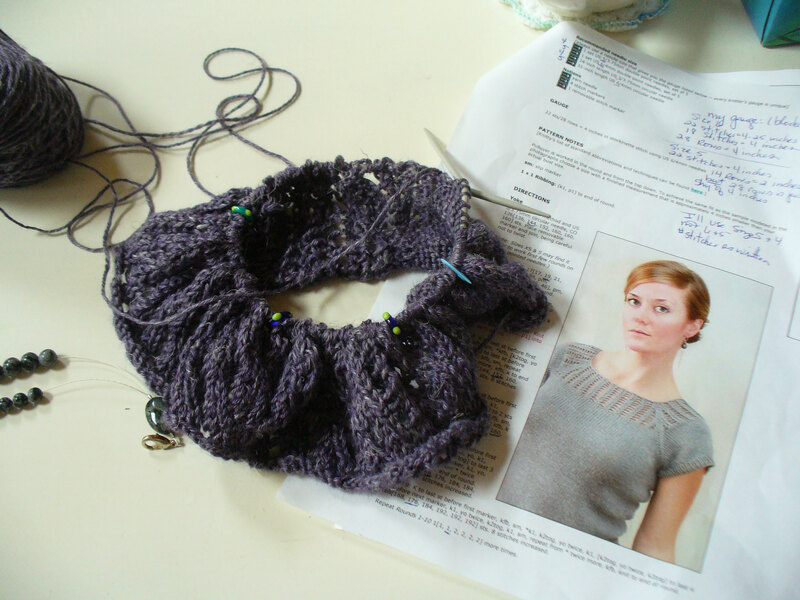 This photo is from when I completed the first repeat – I have done several more since then. It is such fine yarn that this will take a while, but it is interesting, so I think I won’t get bored with it as I usually do with scarves. I finished the Monet Indian Feathers – here are some shots of it unblocked. It is drying now, all pinned out, so I hope to have a finished photo of it for you next time. 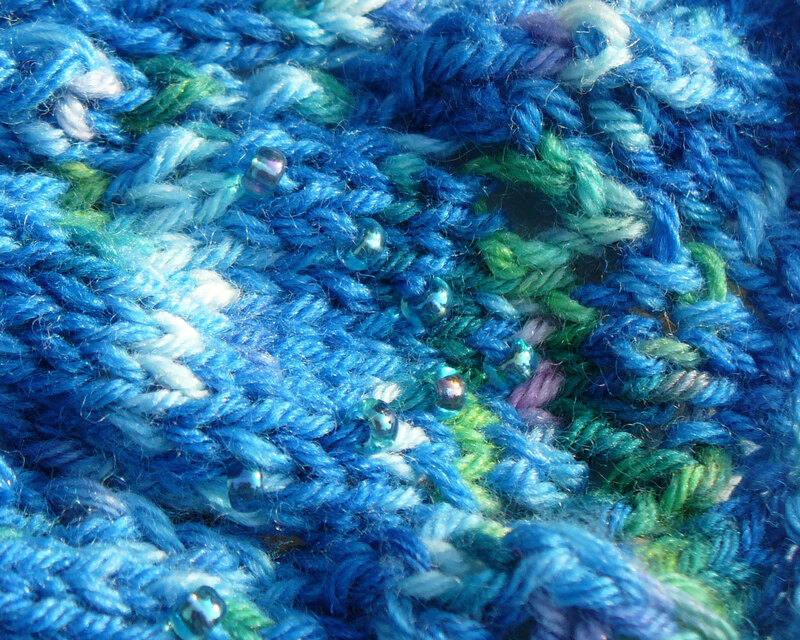 Here, though, you can see the beads (I wound up using one extra pair of beads on each feather), the texture I created with random purl stitches, and the whole shawl laid out. The last thing on my list, but the one that gets all of my attention until finished is the store sample I am knitting for Over the Rainbow. 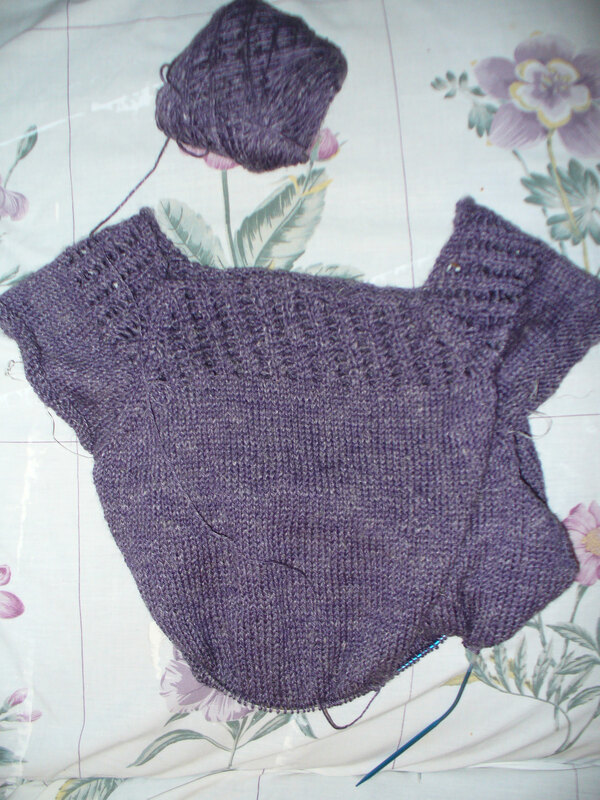 It is Jane Richmond’s Gemini, and I am knitting it in Knit One Crochet Two’s Batiste, which is a wool, linen, silk blend. It is quite nice and soft, and TINY. 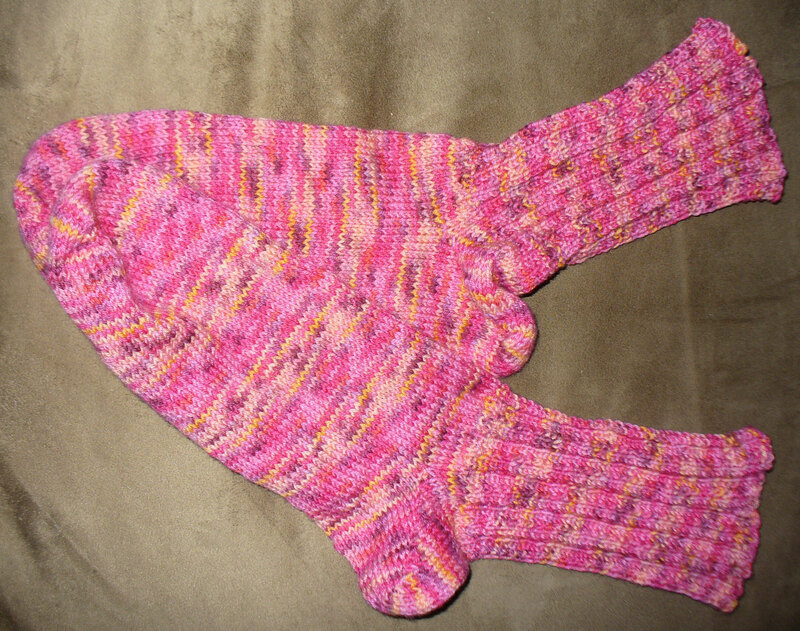 Thankfully, I am knitting it in a much smaller size than I would be making for myself. 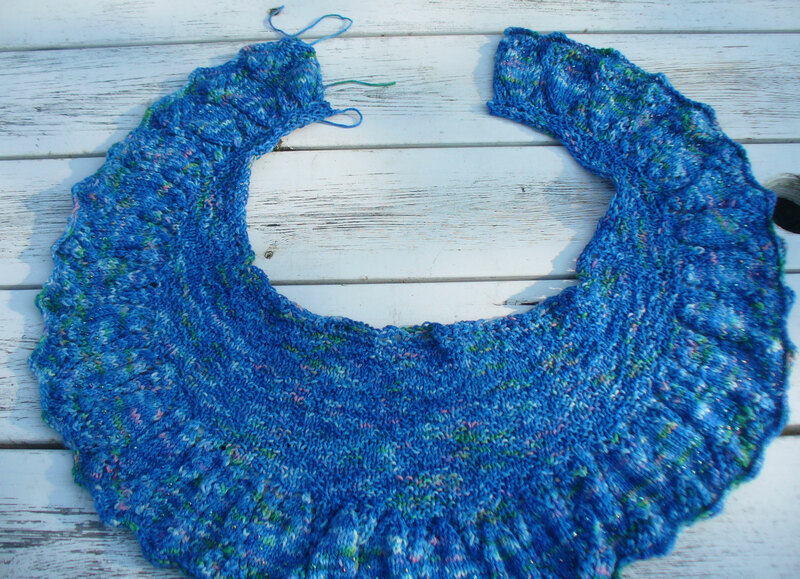 I have often looked at Jane Richmond’s designs but never knit one before. She lays everything out very plainly and clearly, which I like. And the sweater design is very nice as well – it looks like a dropped stitch pattern, but isn’t – the lace is much more substantial than it appears, which is nice in a garment that will get a lot of wear. 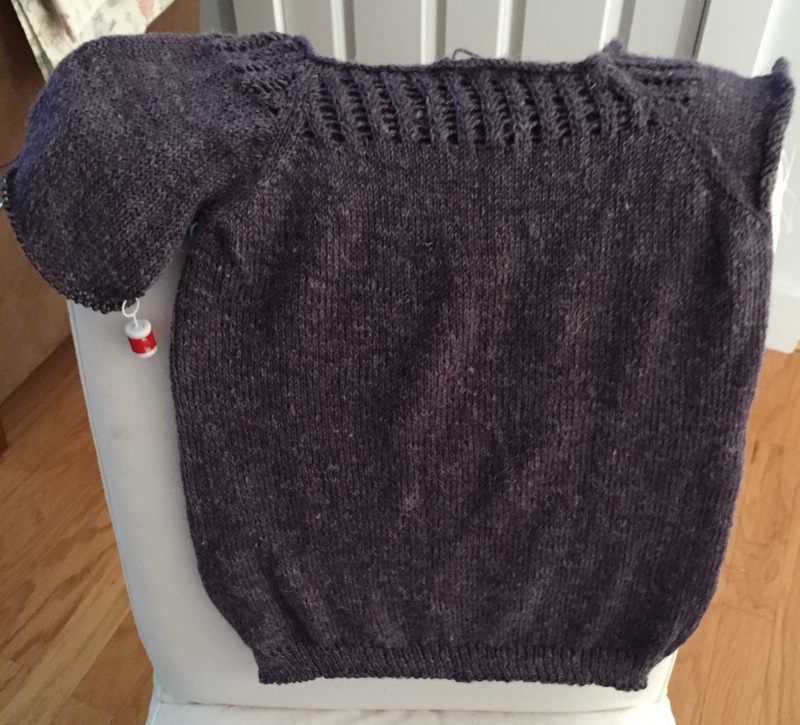 That’s it for knitting world around here – it seems like enough! 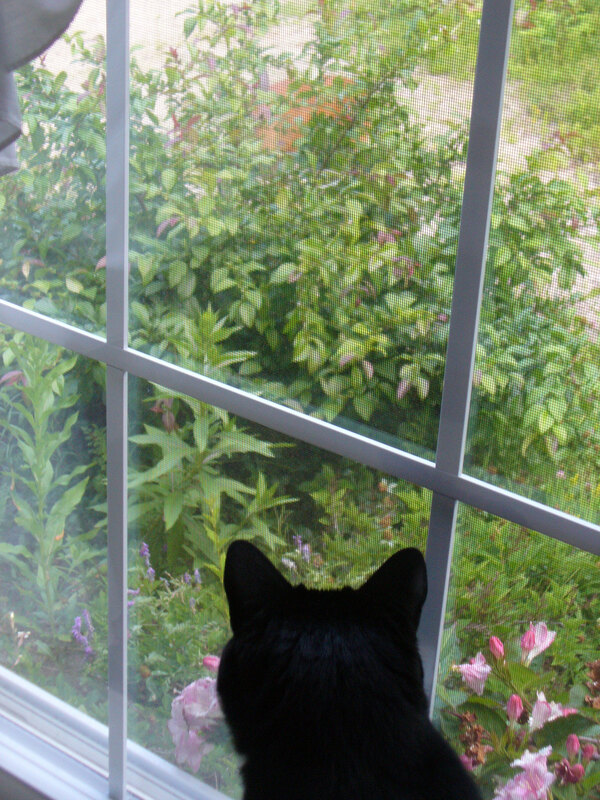 I’ll leave you with this shot of how I prune my shrubs, and who supervises said pruning. This is my auto-pruner. She doesn’t seem to be afraid of anything, she is quite close to the house. 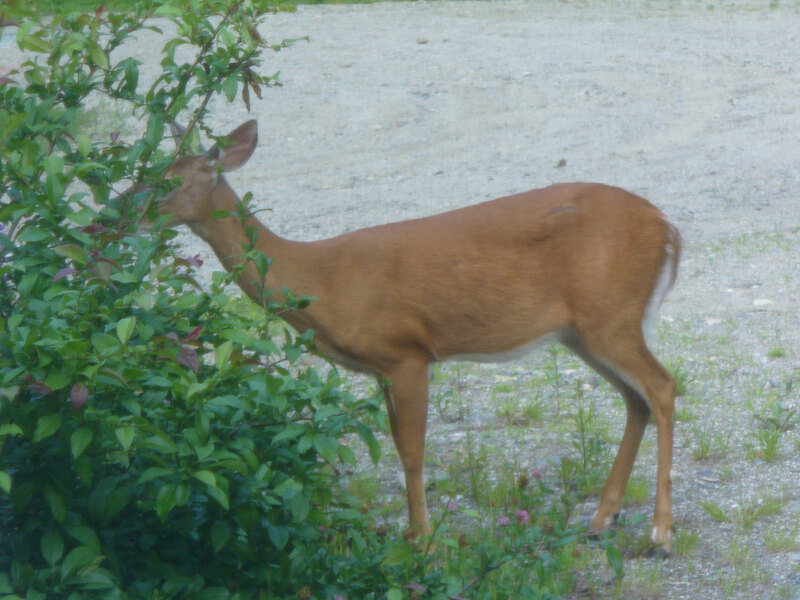 Allie keeps close track of the deer you can just see behind the shrub at the top of the photo. 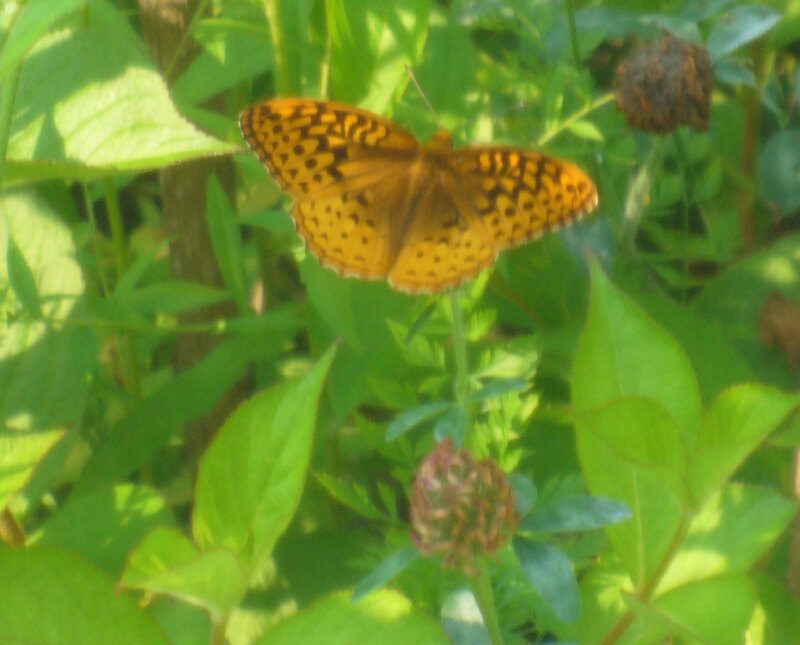 This fellow was out sipping nectar while Allie and the deer did their thing. 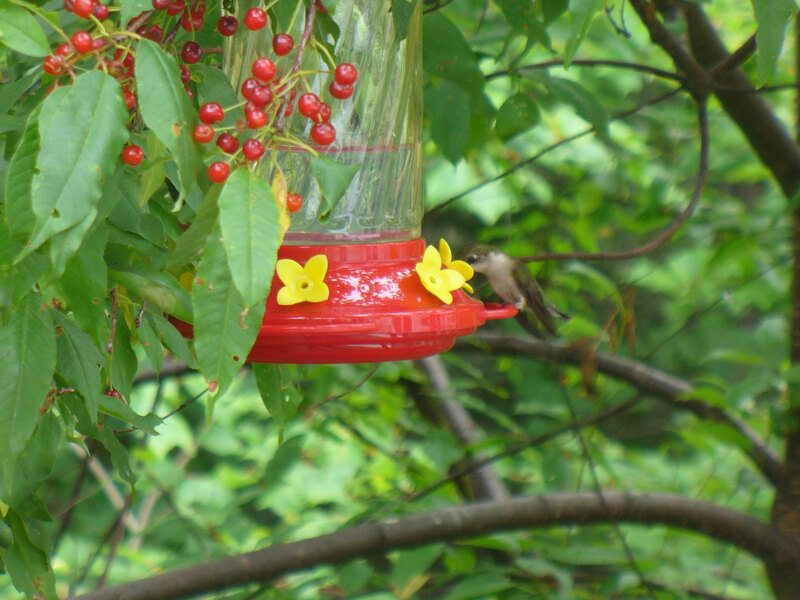 It is through the screen, so a bit fuzzy, I am afraid. 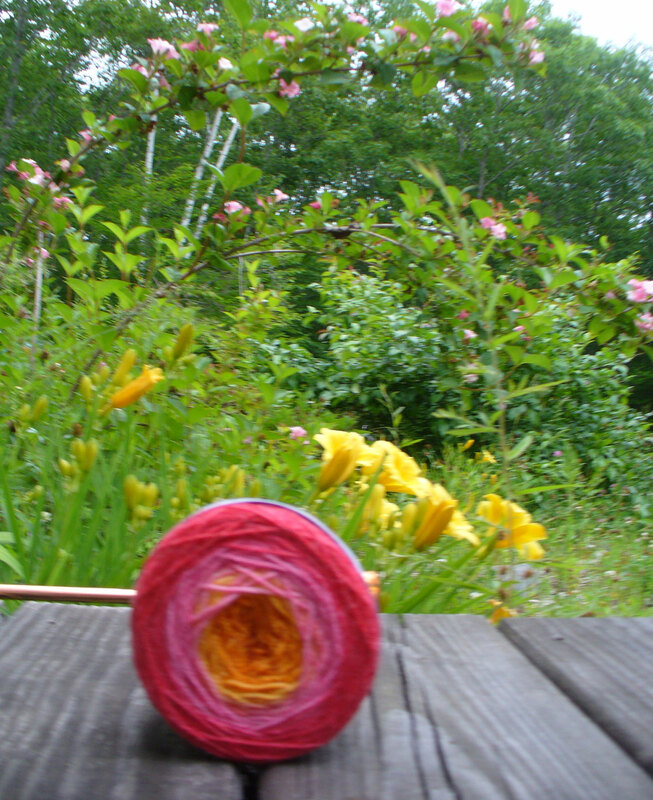 Author salpal1Posted on July 18, 2015 July 18, 2015 Categories how I spent my day, how it came out, what I am making, what I am thinking about making, What's on my needlesTags alpaca yarn, family, knit, l'Hermione, over the rainbow, Purple Fleece, weekend update21 Comments on Lucky for you, it is cold and rainy today! Yeah. Have at it, bud. Don’t forget to be laid back in all that aggressiveness. Anyway….I hope you are all having a fun weekend! Here in the USA, it’s a 3 day holiday weekend, which is very welcome in this household. 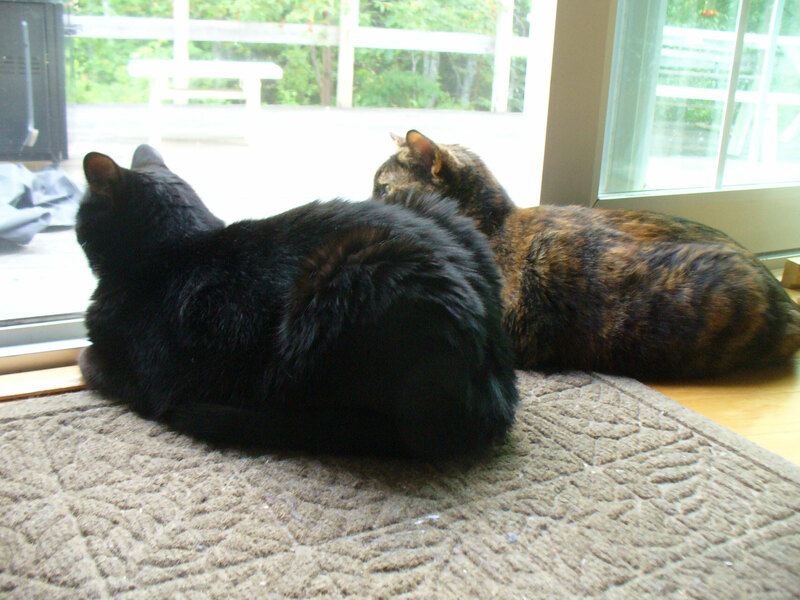 We have done our usual amount of crazy activity, and it feels good to sit down, I have to say. It all started last week when sister-in-law L asked us to host a picnic for the whole family so they could all see her son D and his wife A, who are here for a few days on their way from Madagascar to Colorado. She lives in a small apartment in the city, and we live in a nice country setting with room for everyone, so we often host the family gatherings for her. Of course we said yes, especially as everyone else was bringing the food. All we had to do was clean and get the beverages and desserts. Before this was planned, we had made arrangements to rent a pick up truck to do some big dump runs, so A ran and got the truck Friday morning while I finished cleaning the kitchen. My wonderful brother-in-law M loaded the truck with our accumulated yard/woodshop scraps while we fixed salads, etc. What a treat it was to have the truck full when everyone left, so we could make a quick run to unload the stuff. Today I insisted that I was going to work out in the yard sifting sand and rocks. I did it for about 6 hours, and I can see that I have about twice as much left as I got done today. Which means I won’t get it done by next weekend like I had hoped. But it also means that I am making great progress. I can see the end. 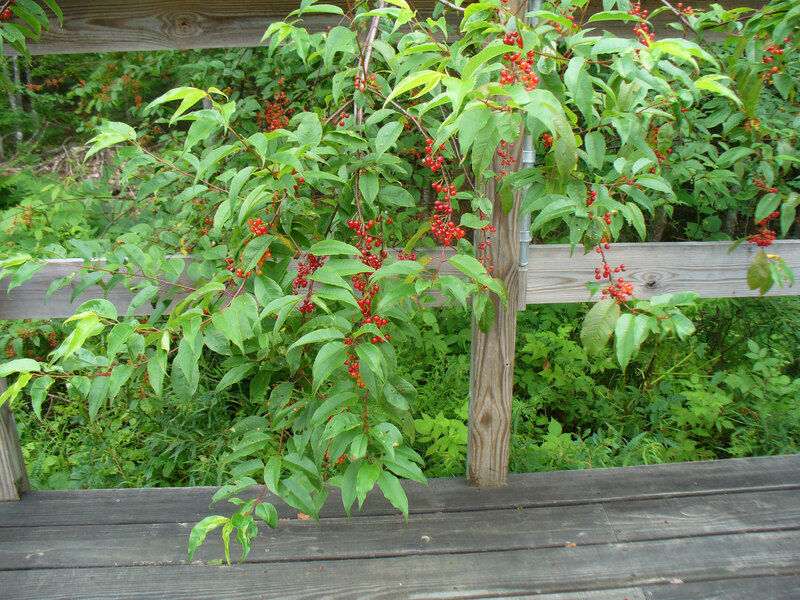 While I did that, A went in search of strawberries for jam. She also returned the truck and went to the grocery store, so we don’t have to do that tomorrow. So this afternoon as I was sifting, she was prepping her 16 quarts of strawberries for jam, and now she is making it, in order to give some to D and A tomorrow before they take off. I also have been knitting away on the current Indian Feathers, with the wonderful Monet yarn – I am loving it, it is so beautiful. 🙂 The beads are working well, larger ones definitely work better. Next time I make this, I hope I remember to try placing the beads with a crochet hook as opposed to stringing them. This works well, but I think that way will look a little bit more balanced. Tomorrow afternoon I have hopes of cleaning off the camera for you. You know how that goes – I get to it eventually, and you get a bzillion pictures of life, all at once. It just is, what can I say?